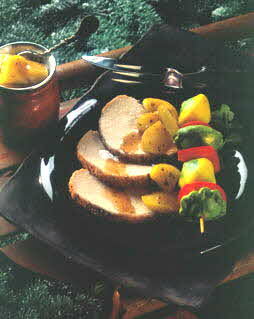 Rub pork loin with olive oil, pepper and 1/2 teaspoon each ginger, nutmeg and cinnamon. In a small bowl, stir together the other half of the spices with the wine, honey, lemon juice and apple wedges. Roast pork in shallow pan in a 350 degrees F. oven for 45 minutes to an hour, until internal temperature (measured with a meat thermometer) reads 155 degrees F.
Remove from oven, let roast rest for 10 minutes. Meanwhile, simmer apple mixture in a small saucepan until apples are tender; stir in any pork roast juices. Serve sliced roast with apples and sauce. The trio of ginger-nutmeg-cinnamon will remind you of pumpkin pie. The spices and apples create a classic flavor that marries well with pork. Any leftover roast is great sliced and sandwiched on rye bread with horseradish sauce.